Beauty is in the detail. When curating a display feature in the home it bodes well not to forget about the little things! Quirky cupboard knobs, door handles, animal ornaments, even down to frills on your pillowcases, which all add drama and interest to your home. One such beautiful piece that adds detail and interest to the home is the Gold Whale Tail Display Piece! A desk accessory as well as an ornament, this stationary piece will keep your paper neatly weighted down whilst looking fabulous in the process! 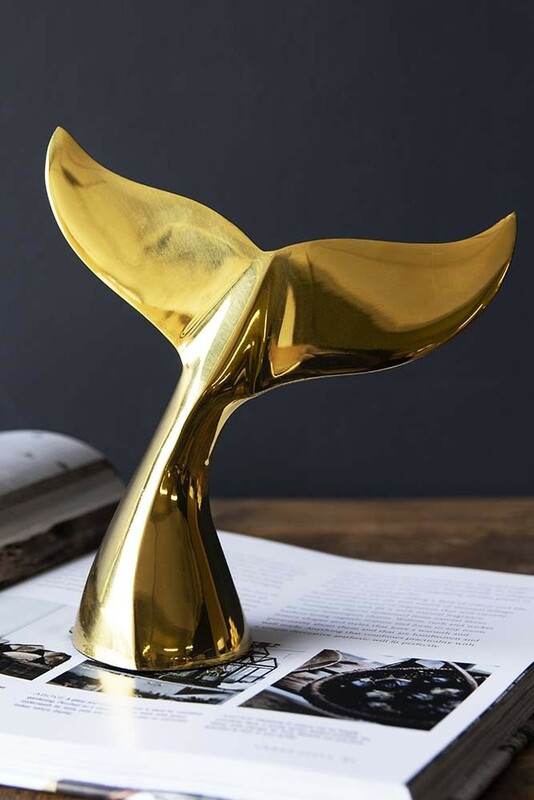 A fabulous decorative ornament too you can display the Golden Whale Tail on your shelves, in your cabinet of curiosities, on your coffee tables, bedside tables or anywhere in the home that you want to inject a little personality and fun! A lovely home accessory too, we think that the Gold What Tail Ornament / Paperweight is a lovely gift for your friends and family.